When it comes to writing, my first love is fiction, so when I took on a nonfiction project, I had no idea where to begin. I knew how I wanted my book to read, but I wasn’t sure how to get there. As the Chinese proverb says, to know the road ahead, ask those coming back, I turned to the experts, namely Lee Gutkind, a creative nonfiction guru. In Keep it Real, various authors contribute their sage advice in this 161-page book. The chapters follow an ABC format and are laden with examples from published nonfiction. Gutkind covers all the bases with short and concise chapters that give practical advice concerning everything from the legalities of writing nonfiction, to deciding whose story to tell. Keep it Real is a great read for memoirists. There are several chapters devoted or pertaining to those who are telling their own stories. 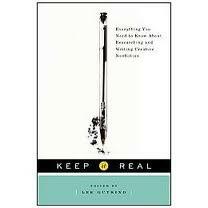 Keep it Real is an easy to follow, quick read with a plethora of examples to learn from. It opened my eyes to the different ways to effectively approach creative nonfiction (including 14 different point-of-view options)! While the book stresses the importance of writing nonfiction creatively, it also shows how important the writer keep it real. Categories: Book Reviews, Research, Writing Process | Tags: book review, creative nonfiction, Gutkind, Keep it Real | Permalink.